How big is a large rodent? Six inches from nose to tail? A foot? Maybe you were thinking about the New York Pizza Rat? What if your kitchen was taken over by the Swedish Viking Rat or it’s bigger Irish cousin? Are you familiar with the R.O.U.S? The mythical Rodent of Unusual Size from the classic movie The Princess Bride wasn’t a figment of the imagination. What if you knew it was real? There really is a rodent out there that weighs 150 lbs. Want to learn more about the world’s biggest rodent species? Read on to learn more. Most people think of house mice and ordinary Norway rats when they think of rodents. The rodent family includes squirrels, beavers, Guinea Pigs and more. In fact, many of the common fur animals are rodents. House Mice: These wee creatures can slip through spaces smaller than the diameter of a pencil. The average mouse is about three inches long plus a slightly longer tail. Field Mice: This type of mouse prefers rural areas and is more brown than gray. This is the mouse that carries spreads Hantavirus. Roof Rat: This black rat ranges from 6 to 8 inches body length. Its tail extends 7 to 10 inches from the body. In Florida, this cable gnawing creature is active year-round. Norway Rat: The brown-gray coat of the Norway rat helps hide it from predators. It is bigger than a roof rat and likes indoor spaces. It is common throughout the world. Gophers: An annoying burrower and bane of gardeners everywhere, the gopher leaves dead plants and dirt mounds all over the garden. The sharp-toothed gopher is known for destroying golf courses and gardens overnight. The Bosavi Woolly Rat of Papua New Guinea was only discovered in 2009. Specimens measure up to 32 inches in length. They weigh-in around 5 lbs. Even bigger, the banana rat or hutia of the Caribbean grows to around 19 lbs. and calls Cuba its home. The U.S. government spends about $70,000 a year to keep the rodents out of Guantanamo Bay. Fur farm escapees like the nutria are nuisances in Maryland, Louisiana, and Florida swampy areas. Nutria look like giant rats and breed prolifically, crowding out native species. They grow to be about a yard long and up to 20 lbs. Nutria dig large funnel systems into embankments and cause shoreline collapse. Their tunneling can be as deep as 15 feet. They are so damaging and invasive that the state of Louisiana has a $5 bounty for each nutria killed. They are an invasive species in Florida and breed uncontrollably. Nutria prefers saltwater shorelines and tidal mud flats. Nutria aren’t the biggest rodent, though. The fossil record shows many rodents that topped 100 lbs. There is only one currently existing rodent in that ballpark. It is the cuddly capybara. This water-loving cousin of the Guinea pig is a South American native. They are about the same size as a large dog and can weigh as much as 150 lbs. They stand about 20 inches at the shoulder. Unlike rats and mice, the capybara does not have a tail or the triangular face. It does, however, have teeth that continue to grow throughout its life. Capybaras must have an opportunity to wear their teeth down. They are herbivores and eat everything from grass to tree bark. Capybaras have webbed feet and live in swampy areas. They are adapted to spending time in the water and prefer to eat, sleep and defecate in and around water. They are social animals and prefer groups of 10 to 40 members. People in Florida keep capybaras as pets, despite the legal restrictions. Unfortunately, these large creatures are smart and strong. Escaped capybaras have established a colony of 50 or so breeding age individuals in northern Florida. Look Out for the R.O.U.S. Capybaras are an invasive species in Florida. Like other invasive species such as nutria, feral pigs and monkeys, the animals destroy native plants and animals, ruin the habitat and can carry disease. The capybara have no enemies in Florida other than hunters. Capybaras generally have no fear of humans, so if you see one wandering, don’t panic. In general, most capybaras are tame. They are unlikely to attack pets or people or damage property. It is in everyone’s best interest to limit their numbers. 150 lbs. of giant rodent in your suburban swimming pool is probably not ideal. 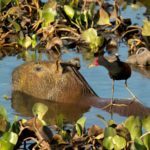 Report feral capybara and other giant rodent sightings to the Florida Fish and Wildlife Conservation Commission. In general, capybara breed 4 to 8 pups a year. Controlling the population with capture and hunting is possible. Nutria also breed 4 to 8 pups a year, but trapping is much less successful. Common house mice, Norway rats, and roof rats breed much faster. One female mouse can have 5 to 10 litters of 6 to 8 pups per year. If you see just one mouse or rat, you know there are many more you don’t see. Just two mice can become 20 in a little over a month with favorable food and shelter. Two rats can easily multiply into 2000 in a year. On top of that, mice and rats are known to be vectors for diseases like typhus and plague. 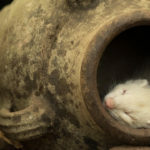 Rats and mice are now virtually immune to common poisons. On top of that, poisons have a way of making it into the ecosystem and threatening wanted species. 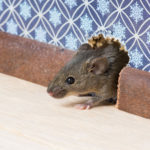 Whether it is the world’s biggest rodent in your swimming pool or the pitter-patter of tiny feet in your attic, Command Pest Control offers fast, professional service to identify your invaders and remove them from your property. We assess your pest problem, sanitation, and situation and then give you a plan for service. We use the least toxic methods possible. We pride ourselves on our environmentally friendly products. We do not use toxic poisons. Contact us today for your free inspection and assessment.